NEW HAVEN — It was a special day for the Guilford girls at the CIAC Class L meet on Thursday with Meredith Bloss earning wins in the 1,600 and 3,200 and Jacqueline Guerra adding another win in the 1,000 for the Indians. Bloss won the 1,600 in 5 minutes, 18.39 seconds and the 3,200 in 11:27.31. Finishing a distant second in the 3,200 was Haley Gens of Avon in 11:44.87. Guerra came away with a victory in the 1,000 in 3:05.46. As a result, Guilford ended up taking second in the team standings with 47 points. Three-time defending champ Windsor was first with 62 points. In the boys competition, Hall took first with 82 points, New Milford was second with 37 and Amity third with 31. Others who did well were Lissandra Marshall of Pomperaug who won the 55 hurdles (8.86) and Nasharie Davis of Middletown who was third (9:06), Jayleen Herrera was second in the girls long jump (14 feet, 111/2 inches) and Katelyn Mullen of Pomperaug was third in the shot put (29-1/4). Bloss took no prisoners in the 1,600 and 3,200, leading start to finish in both races. “In the 1,600 and 3,200 I decided to just go for it,” Bloss said. In the 3,200, with eight laps to go, Bloss led Gens by eight seconds. “Leading at the start, that was the game plan,” Bloss said. “It’s nice to come away with wins in this meet. In the 3,200 I was worried a little bit because toward the end I was getting a little tired. That’s why I kept looking back to see where she (Gens) was. Guerra knew she needed a different game plan from her regular-season plan going into the 1,000-meter event, especially with New Canaan’s Julia Ozimek competing. “I’ve been going out front early in every (1,000) this season, but I knew against her I needed a different plan,” Guerra said. While Ozimek took the lead, Guerra hung back in second place most of the race. As the bell rang signaling the final lap, Guerra made her move. She took the lead rounding the first turn and pulled away, cruising to a win in 3:05.46. Ozimek was second in 3:07.39. “That was my plan, to hang back and then take the lead in the last lap,” Guerra said. “I knew the girl from New Canaan is very talented, so I wanted to hang back save myself for a late kick. In the boys meet, Nick Petruzelli of Notre Dame-West Haven took second in the pole vault although he and winner Patrick Bell of South Windsor tied for the best vault at 13 feet. Bell earned the win because he only took two tries to get past 12-6 and advance while Petruzelli needed a third try. Other boys who did well included Garrett Dandridge of Middletown who won the 55 dash (6.60), Connor Visnic of Amity was second in the 3,200 (9:39.18) and Richard Papa of Amity was third in the 55 hurdles (8:16). Wilbur Cross had a pair of solid finishes with Travis Martin taking third in the 1,600 (4:32.82) and Mahammed Hussain fourth in the 1,000 (2:39.97). Sean Knight of New Canaan was second in the 55 hurdles (7.96). Petruzzelli was unavailable but Notre Dame coach Glenn Xavier called it an off day for Petruzelli. “Nick set the school record this season with 13-8 and the goal here was 14 feet,” Xavier said. “But Nick was using a new pole that he still needs to get used to and he competed with a soreness in his calf. Martin set a personal best in the 1600. Team scores: 1. Hall 82, 2. New Milford 37, 3. (tie) Amity and Darien 31, 5. New Canaan 28, 6. Bristol Central 24, 7. Windsor 23, 8. (tie) Hartford Public and Naugatuck 22, 10. Wethersfield 20, 11. E.O. Smith 19.5, 12. And 18, 13. (tie) Wilbur Cross and Bunnell 14, 15. Fitch 12.5, 16. (tie) Middletown and Masuk 12, 18. South Windsor 10, 19. ND-West Haven 9, 20. Wilton 8, 21. (tie) North Haven and Pomperaug 5, 23. Crosby 4, 24. Kennedy 2. 55 dash: 1. Garrett Dandridge (Middletown) 6.60; 3. Conor Mahony (Masuk) 6.67; 5. Christ N’Dabian (Bunnell) 6.76; 300: 1.Marcus Manson (Windsor) 35.39; 2. Christopher Colbert (Wilton) 35.43; 4. Conor Mahony (Masuk) 36.67; 6. Warren Murphy (ND-West Haven) 37.08; 600: 1. Marcus Manson (Windsor) 1:22.28; 2. Charles Osborne (New Milford) 1:24.09; 1000: 1. Miller Anderson (Hall) 2:37.61; 1600: 1. Trey Cormier (Hall) 4:28.84; 4. Griffin Ott (Darien) 4:33.33; 5. Alex Klarer (Darien) 4:33.83; 6. Ian Carpenter (Amity) 4:38.37; 3200: 1. Trey Cormier (Hall) 9:36.91; 2. Connor Visnic (Amity) 9:39.18; 3. Eli Nahom (New Milford) 9:40.32; 4. Jake Mattei (Amity) 9:47.99; 55 hurdles: 1. Aren Seeger (Naugatuck) 7.85; 2. Sean Knight (New Canaan) 7.96; 3. Richard Papa (Amity) 8.16; 4. Ramsley Exantus (Bunnell) 8.17; 6. Nicholas Pietrini (Pomperaug) 8.73; 4×200 relay: 1. Hartford Public 1:34.19; 2. Bunnell (Christ N’Dabian, Ramsley Exantus, Jonathan Cineus, Elijah Henry) 1:34.96; 4. Amity (Thomas Kanter, Paul Johnson, Joseph Dibenedetto, Richard Papa) 1:35.68; 5. Masuk (Conor Mahony, Matthew Machan, Christopher Tillotson, Maxwell Mastrorocco) 1:35.95; 4×400 relay: 1. New Milford (Michael Tarby, Luke Chastain, Chase Schuster, Charles Osborne) 3:33.42; 4×800 relay: 1. Hall 8:15.86; 2. Amity (Jake Mattei, Andrew Burford, Ian Carpenter, Connor Visnic) 8:15.90; 3. New Canaan (Max Koschnitzke, Henry Asker, Noah Levine, Alexander Urbahn) 8:25.03; 1600 sprint medley: 1. Hall 3:39.66 (meet record); 2. New Milford (Matthew Bouzakis, Andre Vial, Michael Tarby, Charles Osborne) 3:44.34; 3. New Canaan (Sean Knight, Griffen Dayton, Max Koschnitzke, Alexander Urbahn) 3:46.43; high jump: 1. George Stoughton (Wethersfield) 6-2; 2. Kayin Chisolm (Darien) 6-0; pole vault: 1. Patrick Bell (South Windsor) 13-0; 2. Nick Petruzelli (ND-West Haven) J13-0; 3. Kayin Chisolm (Darien) 12-6; 4. Hendrik Vossler (Darien) 12-0; 6. Zachary Matson (New Milford) J11-6; long jump: 1. George Stoughton (Wethersfield) 21-6.5; 4. Patrick Duncan (Pomperaug) 20-5; 6. Cameron Raia (Darien) 20-1; shot put: 1. Peter Tomanelli (E.O. Smith) 49-2.75; 2. Jack Conley (New Canaan) 49-0; 3. Michael Neary (Darien) 48-3.5; 4. Jacob Meadows (New Milford) 47-2. Team scores: 1. Windsor 62, 2. Guilford 47, 3. Simsbury 46, 4. Hall 38, 5. Avon 36, 6. Conard 30, 7. (tie) New Milford and Wilton 24, 9. Darien 23, 10. (tie) New Canaan and Hartford Public 18, 12. Fitch 14, 13. Bristol Central 12, 14. (tie) Pomperaug, Mercy and Maloney 11, 17. E.O. Smith 9, 18. (tie) Hand and Cheshire 7, 20. (tie) Bunnell and Middletown 6, 22. (tie) Lyman Hall and Woodstock Academy 1. 55 dash: 1. Dinedye Denis (Simsbury) 7.31; 4. KC Grady (Darien) 7.54; 300: 1. Dinedye Denis (Simsbury) 40.89; 6. Fabiola Millien-Faustin (Bunnell) 43.48; 600: 1. Elsa Martin (Simsbury) 1:40.44; 1000: 1. Jacqueline Guerra (Guilford) 3:05.46; 2. Julia Ozimek (New Canaan) 3:07.39; 1600: 1. Meredith Bloss (Guilford) 5:18.39; 3. Julia Quinn (New Milford) 5:27.17; 6. Shae Zeitler (New Milford) 5:30.97; 3200: 1. Meredith Bloss (Guilford) 11:27.31; 5. Brooke Morabito (New Milford) 11:59.17; 6. Onora Brown (Darien) 12:03.99; 55 hurdles: 1. Lissandra Marshall (Pomperaug) 8.86; 2. Shelby Dejana (Wilton) 8.87; 4. Darcy Cook (New Milford) 9.08; 5. Abigail Cragin (Darien) 9.40; 6. Isabella Azar-Brandes (Pomperaug) 9.41; 4×200 relay: 1. Windsor 1:46.64; 4. Wilton (Andreen Reid, Maureen Campbell, Shelby Dejana, Anna Sherman) 1:51.05; 6. Bunnell (Kesiri Gonzales, Dardielle Exantus, Daniela Petillo, Fabiola Millien-Faustin) 1:51.76; 4×400 relay: 1. Windsor 4:10.79; 5. Darien (Charlotte Sulger, Suzanna Alliegro, Erica Blaze, Eva Finn) 4:19.67; 4×800 relay: 1. New Milford (Sara Grudzwick, Julia Quinn, Brooke Morabito, Darcy Cook) 10:01.98; 4. Darien (Cameron Appelby, Sophie Hill, Marley Garfield, Daphne Cutler) 10:07.24; 5. New Canaan (Elaina Tiller, Emma Ognibene, Katie Miller, Chloe McAuliffe) 10:16.86; 1600 sprint medley: 1. Windsor 4:28.16; 2. New Canaan (Elizabeth St. George, Katie Miller, Chloe McAuliffe, Julia Ozimek) 4:30.35; 3. Darien (KC Grady, Erica Blaze, Eva Finn, Daphne Cutler) 4:32.17; 4. 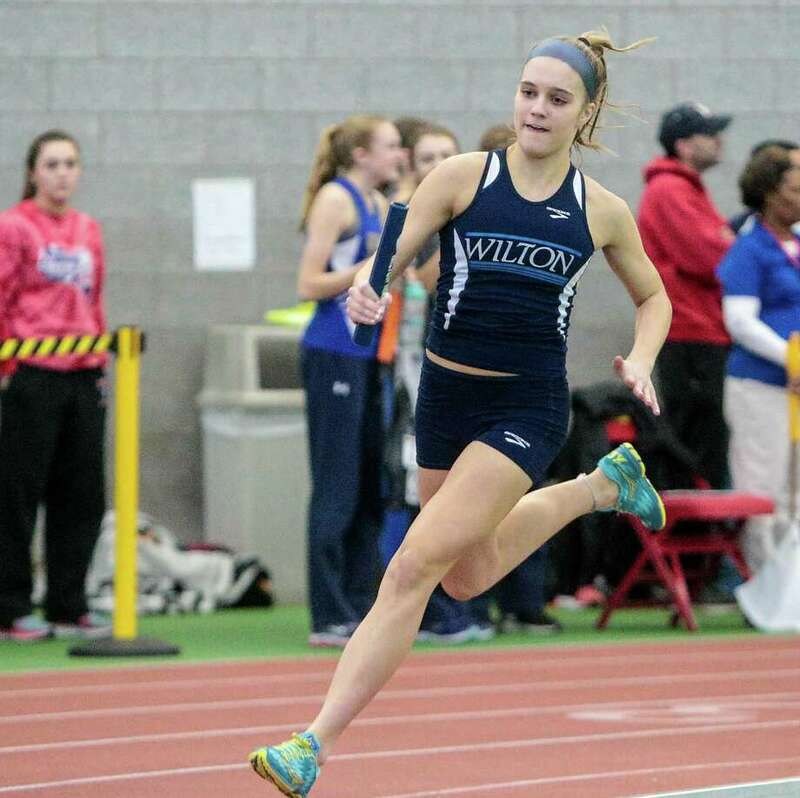 Wilton (Maureen Campbell, Shelby Dejana, Janet Johnson, Morgan McCormick) 4:33.04; high jump: 1. Taryn Smith (Hall) 5-0; 4. Wadline Emmanuel (Bunnell) 4-8; pole vault:1. Hannah Coutier (Maloney) 9-6; long jump: 1. Olivia Bowes (Hall) 17-2; 3. Andreen Reid (Wilton) 16-3.5; 4. Abigail Cragin (Darien) 15-10; 6. Darcy Cook (New Milford) 15-6; shot put: 1. Benedicte Alula (Hartford Public) 35-8; 5. Covadonga Perez Pelaez (Wilton) 32-2.5.